Jones strikes a confident pose in another of the hideout photos. Parker and Barrow pose in two more of the hideout photos. The group may have escaped police at Joplin, but what it left behind in the rented second story walk-up was a roadmap to their identities and their lives on the run. There was no longer any question in law enforcement's mind as to who the killers were. Among the many items found in the apartment were Buck and Blanche’s marriage license, Buck’s parole papers (only three weeks old), a large arsenal of high-powered weapons — and a handwritten poem along with a camera and several rolls of exposed film. 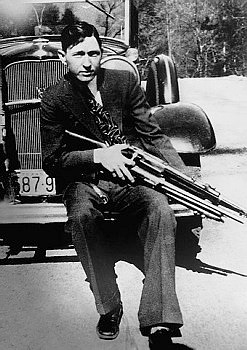 The film was developed at The Joplin Globe newspaper and yielded the now-famous photos of Barrow, Parker and Jones clowning around and pointing weapons at one another. 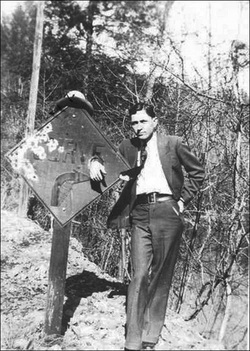 The poem and the photos, including the one of Parker holding a pistol and clenching Clyde's cigar in her teeth, went out across the country on the newswire. The five became instant front page news across America as The Barrow Gang — fully illustrated with exciting photos and Parker’s "Story of ‘Suicide Sal’" poem as a backstory. The nation was instantly captivated. Whether Buck was really there just to talk to his brother or to join up was now moot. There was no turning back. He was firmly linked to the gang. For the next three months, the gang ranged from southern Texas as far north as Minnesota, committing numerous robberies. Two more photos from the hideout in Joplin. On April 27, the gang was in Ruston, La., and in search of a car. As Barrow drove along North Trenton Street, a quiet, residential area, he spotted a new Chevrolet parked in a driveway. The vehicle belonged to H. Dillard Darby, 35, a mortician at the nearby McClure Funeral Home. Darby, who lived at the Brooks Boarding House, was inside eating lunch. As Barrow drove by, Jones jumped from the car and ran to Darby’s vehicle. As luck would have it, the keys were in the ignition and Jones was able to start it quickly and start to drive away. Darby, however, witnessed the theft, ran from the house and began to give chase as he watched his vehicle gain speed and disappear. Sophia Stone, 27, a home demonstration agent, had also witnessed the theft and offered to give chase with Darby in her car. The couple had only gone a few blocks before they were stopped by a second car. Inside was Clyde, Buck, Bonnie and Blanche. When Barrow asked what had happened, Darby started to explain but Clyde grabbed him by the collar and forced him into the car while Bonnie allegedly forced Stone out of her car and into the gang’s. 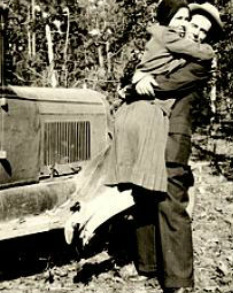 The young couple were threatened with their lives, but later said Bonnie and Clyde started to talk and kid with them, seemed to take a liking to them and promised to release them unharmed. They drove into Arkansas, and just outside Waldo, on a desolate road, the gang let the couple out. They said the Barrow car sprayed them with gravel as it began to speed away, but braked hard just a few yards down the road and began backing up. The couple late said they were certain the gang was about to kill them. However, Bonnie leaned out and handed them a $5 bill, telling them to use the money to get back home. This was one of several incidents between 1932 and 1934 in which they kidnapped lawmen or robbery victims, usually releasing them far from home, sometimes with money to help them return. These encounter stories made headlines - but so did the darker encounters. The Barrow Gang would not hesitate to shoot anyone, lawman or civilian, who got in their way. Eventually, the increasing number of these killings would not only sour the public perception of the outlaws, but lead directly to their undoing. While the photos in the papers might have suggested a glamorous lifestyle, in reality they were desperate, discontented and miserable, as noted in Blanche Barrow’s account of their lives. With their new-found notoriety, even the smallest tasks of everyday living became increasingly difficult. Tourist courts and restaurants were replaced by campfires and sleeping in the car. And the unrelieved, endless life on the road for five people in the same car quickly gave way to constant bickering and vicious arguments. So unpleasant, in fact, that when Jones stole Darby’s car he simply kept driving and managed to stay separated from the others until June 8 when he rejoined them. Above is the Brooks Boarding House, as it appeared about the time of the incident. It was torn down in the 1970s, and was a vacant corner lot in the 1990s. 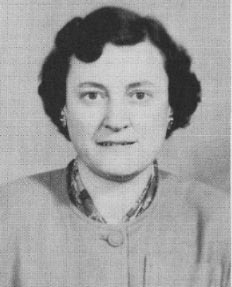 Above right is Sophia Stone Cook (wife of William Henry Cook Jr.) as a high school home economics teacher in 1953. At lower right is Mrs. Cook shortly before her death in 2000. Jones and Parker are pictured above. At left is Blanche and Buck. 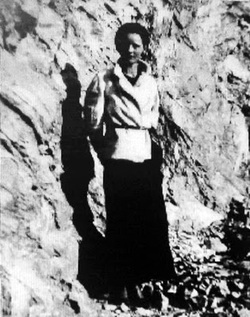 Blanche Barrow strikes a dream-like pose while on the road with the gang.